Detroit—“Power of Pink,” a Planned Parenthood volunteer training conference, drew over 2,000 young women to Detroit July 27-29. The beauty, energy and strength of this rainbow of women filled the cavernous convention center. The focus of the sessions was organizing to win elections for supportive candidates. Demonstration in support of Planned Parenthood. Photo by Terry Moon for News & Letters. At first I was annoyed at the elaborate security procedures, but then I thought about the real and ongoing history of violence against abortion rights advocates, women of color and LGBTQ women. Sadly, those measures were more needed here than taking off my shoes at the airport. 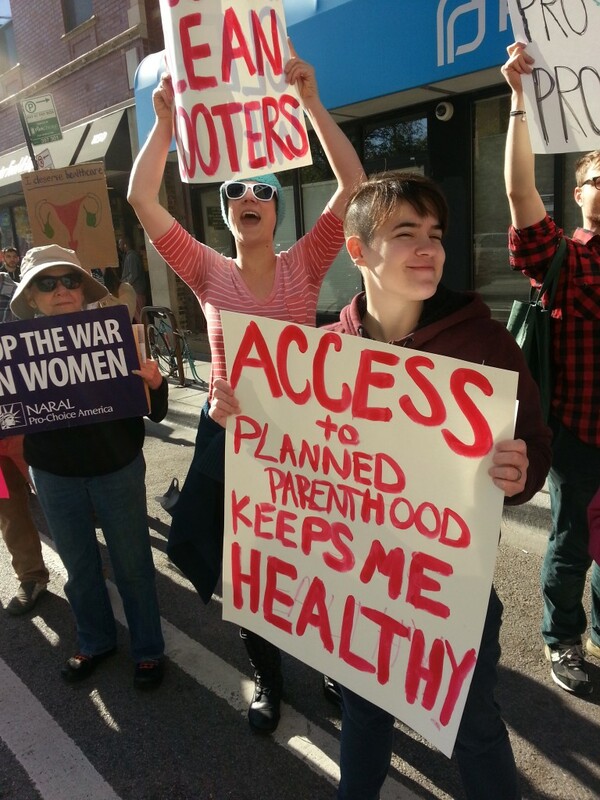 This entry was posted in Articles and tagged abortion rights, Detroit, Donald Trump, lgbtq, Planned Parenthood, Reproductive Health, Susan Van Gelder, women of color. Bookmark the permalink.